At the very beginning of this story we learn that Michael, its first-person narrator, had something terrible happen to him as an eight-year old and he subsequently became known in his native Michigan as ‘Miracle Boy’. Although he has physically healed following this event he has not uttered a word since the day of the event. In the same opening sequence we find out Michael has been in prison for more than nine years; since he was 18 years old. What unfolds following this, in a complicated non-linear fashion, is Michael’s journey from one point to the other. Michael is re-telling his story from his vantage point in prison but he can’t, at first, go right back to the ‘awful event’. Instead he has three fairly distinct narratives that unfold a little bit at a time in intervening, short segments. The first of these strands covers the period immediately following ‘the event’ when he is taken in by his uncle Leo, begins the slow recovery process and undergoes the seemingly endless round of counselling and testing that would inevitably follow such a thing. Then there is a strand dealing with his move from being a junior to a senior in high school and his previously hidden talent, as someone who can pick locks, becomes more widely known. This is also when he meets Amelia, his true love, and begins an unorthodox, speechless ‘conversation’ with her that lasts, on and off, for the rest of the book. The final strand covers the period when he prematurely finishes school and becomes the box man (safe cracker and lock picker) for a loosely connected network of criminals. Although complicated, I managed to follow this structure easily enough once I got into its rhythm and it did allow the story to build up suspense. I do wonder though if it was part of the reason the book felt unnecessarily long, as there were some things that were repeated in each distinct narrative thread that really only needed to be told once. For example, I reached my limit of interest in the mechanics of lock picking and safe opening well before the end of the book. The only character depicted with any depth at all in this book is Michael so as a reader you have to find him pretty compelling to be fully engaged with the novel. For me this happened most successfully when he met Amelia and demonstrated the lengths he would go to for her protection. As he described the creative communication method they developed because Michael couldn’t speak I got a real sense of him, his thoughts and feelings. For the rest of the novel though I found him a very passive character, describing things that were done to him or events beyond his control and not really acknowledging his own role in events. While at times this was realistic at other times it felt a bit like a cop out and lessened my engagement with him as a character. 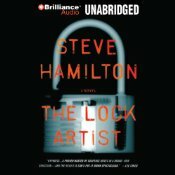 I found The Lock Artist entertaining, even if I am not as overwhelmed by it as some of its reviewers. I liked the structure and the ‘coming of age’ element of Michael’s story but was less captivated by those parts of the story that dealt with his unique talent and the trouble it caused him. The forced coincidences of these events and Michael’s passive involvement lessened my overall enjoyment of the book just a little. MacLeod Andrews did a great job narrating the book, managing to make his voice ‘age’ subtly for the different narrative threads. Still this is probably not an audiobook I would recommend to listening novices as these kinds of non-linear plots can take a little getting used to in audio format. This entry was posted in book review, Steve Hamilton, USA. Bookmark the permalink. Bernadette – Thanks – a terrific review as always. That’s an interesting approach to telling a story, actually, and I can see how it could work if it’s done well. Interesting premise, too. You’re right that, especially in that sort of a novel, where there aren’t many characters, one would have to have a real attachment to a character in order to stay engaged in the story. It’s got some intriguing elements; I may give it a try…. Good review, Bernadette, as ever. I don’t think it tempts me to read the book, though – I’d read some mixed reviews or accounts (not sure where, now!) and the subject matter doesn’t really make me want to rush out and put it to the top of my pile…..but maybe I’ll bookmark it just in case I should run out one day 😉 I have now been given a “smartphone” which I cannot work out how to use – seems to do everything but make phone calls! — but it has reminded me that I really must get this audio format sorted out. (I presume it “does” audio as it arrived with a pair of earphones among other paraphenalia). Good review. I tried to read this book and could not get into it. The character didn’t compel me to read about him. Something put me off when I began the book and I took it back to the library unread. One book that was nominated for a few of the same awards, which is how I learned about it, which I thought was one of the best books I’ve read this year is Crooked Letter, Crooked Letter by Tom Franklin, who is a literature professor. It’s well-written with compelling characters, a mystery and more. I gave this one a 3 1/2, it didn’t absorb me the way I expected it to. Great review. Glad to have found your blog.